What makes a happy customer – and have you got it? Finding out the answers to these questions must be high on a customer service team’s list of priorities. After all, if your customers’ trust and like your organization, its sales will be stronger, its reputation will be greater, and it will retain good staff members more easily. So, what do they think right now? It could be painfully clear that your service isn’t great, but you might not be sure how to improve it. On the other hand, you may be streets ahead of your competitors when it comes to customer satisfaction, but you wonder how long that will last. To customize this template after signing up, choose ``Customer Survey Quiz`` as example when creating a new survey. Why Build a Customer Service Quiz? While customer service tips are considered as best practices, customer service training is key for upgrading your support skills to deal with different types of customers and deliver higher satisfaction. The customer service training aims to improve soft skills, like communication and emotional intelligence, but also technical skills, including typing speed and software knowledge. Training programs come in different flavors – customer service training manuals, courses, tests, e-books or workshops. But a well-thought-out interactive quiz can give you a clear indication of the quality of your customer service. Instant results allow you to quickly analyze the data you’ve collected and use the insights to improve your customer service. Build, sculpt and craft your quizzes to take on every kind of situation. Awesome features like Offline Mode, Multiple Languages or Save on exit will make your quiz creation feel like a dream. 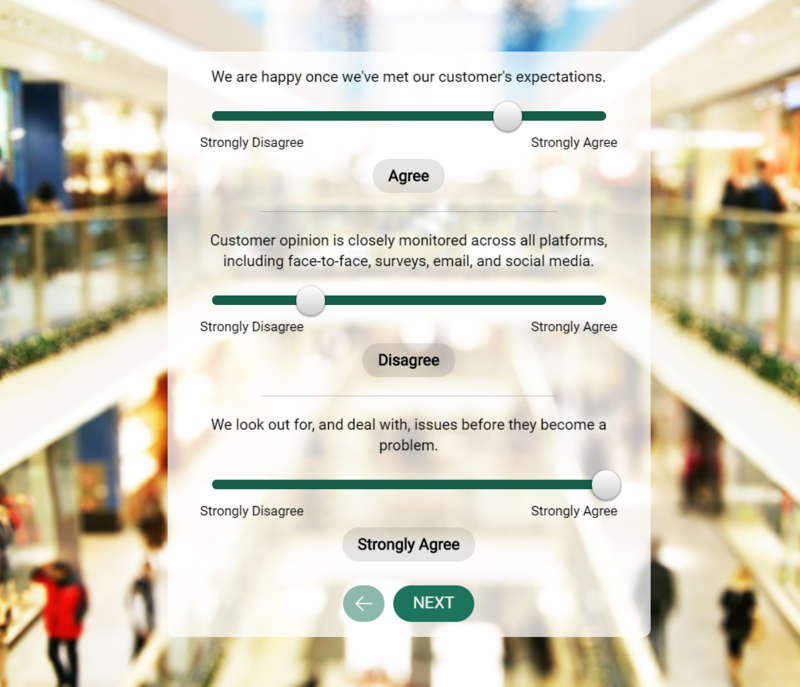 To use this sample Customer Service Quiz example, sign up for Survey Anyplace , and choose ‘Customer Service Quiz’ as a template when creating a new survey. Always put yourself in customer’s shoes. When dealing with difficult customers and their perplexing requests, the ability to put yourself in their shoes is key to help them without starting a conflict. Use positive language only. Stop using “I can’t”, “I don’t know” when you’re helping the customer. Instead, focus on what you can do to help your customers. Keep your cool. Often, you need to handle a difficult customer who is irritated and blame you for all the world’s evil. First and above all, remain calm and don’t let a customer see you’re boiling inside. Second, remember that you are there to help the customer, not to take the blame. Focus on solving the issue. Doing small talk is a good way to build connections, but let’s face it: solving the problem is the most important thing in customer service. Use different support channels. ”Please send us a mail.” does not work anymore. Your customers are present in various channels, so should you. Being available via live chat, phone, email or social media reassures your customers that you’ll be there when they need you. Resolve the case as fast as possible. When you want to deliver the WOW effect, focus on responding to customers as fast as possible. There is a direct correlation between the speed of response and customer satisfaction. So the faster you respond, the happier your customers are. Never stop improving your skills. It’s crucial to never stop working on your customer service skills. The best way to do it is to train yourself regularly. Whether you prefer e-learning, workshops or certifications, is up to you. Automate repetitive actions. Make your work easier by automating some of your routines. Tired of getting the same question ten times a day? Create a reply template and use it when appropriate. Looking for more quiz software templates and examples?